NEW YORK CITY — The NYPD needs to work more closely with the city's embattled Administration for Children's Services to help investigate complaints of violence against kids — because their expertise could help prevent another child from being killed, the head of the city's Department of Investigations told DNAinfo New York. And the NYPD is willing to increase their role with helping ACS, sources said. Mark Peters, the city’s DOI commissioner, who has published a string of reports revealing systemic ACS failures in the wake of the deaths of abused children, told DNAinfo New York's "On the Inside" that “there is absolutely no doubt that, based on what we have learned to date in our various ACS investigations, that there is a need for increased NYPD involvement in some of these issues. At Police Headquarters, insiders tell "On the Inside" that top brass are now willing to take on a more proactive role if asked to by City Hall, which only recently came around to asking the NYPD to help improve public safety at city homeless shelters after years of resistance. 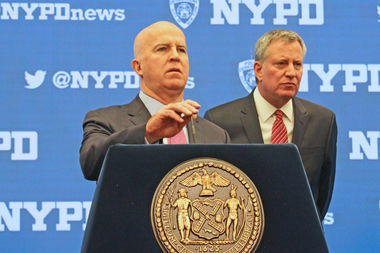 Fairstein, who also serves on the board of Safe Horizons, a victim’s advocacy organization, believes that complaints involving abuse or violence — as compared to parental neglect or maltreatment — should immediately involve the NYPD because they have the investigative training and access to an array of criminal and non-public databases that could lead to quick and potentially life-saving intervention. Under current rules, ACS social workers have the discretion — but are not required — to call in the police as they follow through a checklist of protocols that are designed to confirm that a case is legitimate and then determine what course of action is appropriate. On Nov. 25, 2016, for example, ACS received a report that a 3-year-old, Jaden Jordan, was being kept in a dog cage by his mother’s boyfriend, who was terrifying the child with the animal. Two ACS workers went twice that weekend to the address they were given, but went away without finding the family because the address was off by one digit. They only found the correct address on the following Monday, but by then the boy had been beaten unconscious and was critically injured. A former NYPD commissioner added that there is a "disconnect" between social workers and the police. "ACS personnel frequently do not understand that an assault on a child is an assault of a child, whether it is in the home, or on the street, and the police should be involved from the start,” the commissioner said. A source close to a number of ACS investigations said "there is a misunderstanding, that if you bring law enforcement in, you can't do social work," and that ACS officials sometimes "forget their first goal is to keep children safe," not to necessarily keep the family unit together. Union leaders for the city's ACS workers say they would welcome a closer working relationship with the NYPD, but they are reluctant to want police to have a direct role at their agency. "Our people are professional and do the best they can, and the police would not do anything differently," a union leader recently told "On the Inside." "We know we have a dangerous job and can call them when needed," the union boss explained, adding that people who abuse children are the real "monsters," not the case workers. An ACS senior official, who asked for anonymity, said the agency already has more than 100 retired police officers working in the agency's investigative arm, which are called in "the most complex, serious cases" and has a long-standing relationship and partnership with NYPD "to thoroughly respond to allegations of child abuse." "Collaboration on all levels is vital, however, law enforcement is not child welfare work," the official said. "A frontline caseworker is trained to investigate maltreatment in a specific manner, trained to interact with children and families in a specific manner, trained to elevate cases in a certain manner" with discretion to reach out to the NYPD." For his part, Mayor Bill de Blasio continues to support ACS, and has downplayed the severity of problems at the agency in the wake of several deaths that prompted the departure of his ACS commissioner and a search for a successor. While a request for comment from City Hall was not returned, a close friend of de Blasio tells "On the Inside" that the mayor, who was elected on a largely anti-police platform, is "predisposed against" ACS and the NYPD working more closely. “It would be viewed as another intrusion of police in minority communities, and another flashpoint of police locking up black and brown people in their neighborhoods,” the source pointed out. “It may be difficult for the mayor to get there, and especially in a re-election year," the source added, "but the time may finally be here." Because as one top police official noted, "it is better for the police to take a child out of a home then the medical examiner."